This IS profound. Seriously profound. does not depend on time (day and night) and space (bed). One IS awesome, one does not need to make it to be an agenda for the day. I know, Geir, I know…Take it as a cynical joke…:) I’ve just expected a longer post, that’s all 🙂 Otherwise, you are an inspiration for me, as always. I feel the same coming out of the OP….One IS Life….profound it is…. playful guy you are! Me is just laughing here now….amazing post! Only a few of us manage that. Sounds real good (and very profound :)). You got me to smile… . I like the teasing, light and simple things between :). How many days of my life have I spent already without being awesome. Probably 99%. Thanks for waking me up! 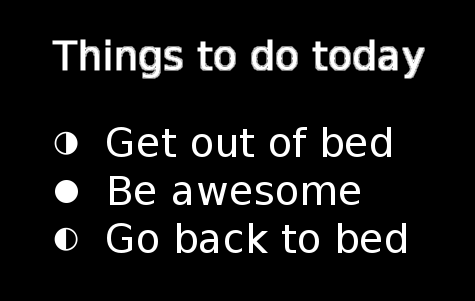 Today I WILL be awesome! I explore the potential of free will. I help people exercise their potential and achieve what they want. Here you will find creations of art, music, fiction, philosophy, programming and other technical stuff, HP calculators, thought provoking blog posts and much more. You may use everything on this blog for any purpose as long as you give due credit. Other sources than Spotify, click here. Did Scientology have a positive impact on their lives?